Celebrity women are parties delight any time. When you see them at parties, you can be sure that the party, will be lightened up. One of such parties was when popular Juju musician, Queen Ayo Balogun, celebrated her 60th birthday in Lagos. The party was 70 percent full of women, why? because Queen Ayo Balogun has many friends across ethnic and religious divide. Many celebrity women stormed the party in their white-and-black ankara matched with white headgear. Almost all the women wore the Aso Ebi because the party was more or less a show of class. The celebrity women are usually life and soul of any party because with women, you can be sure of having an unlimited fun. These sets of women are big time textile merchants, some are into haulage business, some are upward-mobile career women in top places, while others are behind some money spinning companies. They cherish to look good and that was what happened at the party as most of them stepped out in their best attire. One significant thing about all of them, apart from wearing the same outfit, is that their neck did all the talking with their expensive jewellery which were in diamond and gold. First, is the celebrator, Queen Ayo Balogun, who looked astonishing in her all sequined black background multicolored frock fit for queens. It matched her look which was frilled with a dazzling gold jewellery that was complemented with beautiful silver shoes and purse. She also stole her show by changing into an all-white attire and she was the cynosure of all eyes at the party. sighted at the party was her sisters, shola and Bukky who looked beautiful in their uniquely sewn Ankara style. They were up and doing at the party. Labisi Ojo, another celebrity woman in her 60s who never looked her age, had up to 2 tables to herself and was seen attending to guests. Akinsanya, Ola Aladesuru, Nana Yakubu who are Queen Ayo Balogun best friends. Lara Akinsanya is a popular socialite, who sits atop affordable shopping mall. She is also a big time fabric merchant and runs a catering company as well. She spotted her aso ebi with a lovely, white top and diamond stud jewellery. She had suspend her US trip to attend her friends party. Nana Yakubu, is another money bag who love to live quietly but her appearance at any party would tell you she’s is an expensive woman, the NPA topshot frilled her aso ebi with a silver jellery as Ola Aladesuru, who runs one of the popular hotels in Amuwo Odofin area of Lagos. One thing about her at the party was that he carriage and charisma were attention attracting because her Ankara style was really unique. 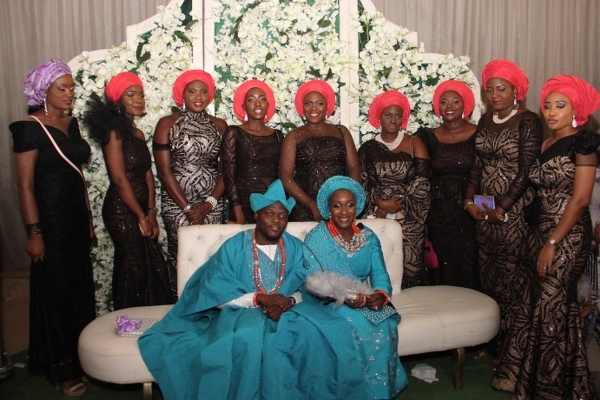 Sir Bolu Okeowo’s wife, Adejoke, was not left out. The beautiful woman wore the aso ebi headgear and complemented her look with a lovely gold jewellery. Tola Solomon who is an Abuja celeb woman was at the party with Lekan Osifeso. She looked beautiful in her aso ebi as, she sat with some of her friends. Sighted at the party too was Ayo Lawal,the beautiful wife of a popular property expert,Yemi Lawal. She was spotted not wearing the aso ebi, but wore a beautiful rose gold lace. Popular shipping magnate, Victoria Hastrup, dazzled in her diamond set. Sighted also was the pretty wife of Ondo Commissioner for Finance, Remi Akinterinwa, who is the boss of Remol Event Managers. Her team decorated the hall in a beautiful way. She also looked lovely in her aso ebi. Without gainsaying, Ibadan celeb woman, Jade Kudus, is indeed a society woman to the core as musicians praised to high heavens at any party. She runs one of the biggest and thriving shipping business in Ibadan. Very popular within the Ibadan social circuit and highly industrious. She is a force to reckon with as many of her friends love her to be at their parties. She stormed Lagos all for Queen Ayo Balogun and had fun with many of her Lagos friends who were also present. She dazzled in her lovely style of Ankara and matched it with a heavy gold jewelry. Talk of Lagos jeweller, Tejumola Latej, she had unlimited fun. She was at the fore front to usher in the celebrator and danced endlessly at the party. Queen Salawa Abeni looked younger in her outfit, Mrs Iyabode Ode is also not left out, she sewed a lovely long dress and beautified it with Rose gold embroideries, she is also one of the close friend of the celebrant. What of Sade Ben Cash? she is an apologetically party stunner, she dazzled as well, the trio of Yewande Andre, Tola Solomon, Montai and Rhoda Eweka attracted attention. Also on the list is Funke Akinyera, Bukky Collins, Kehinde Adebayo, who came all the way from UK, other celebrities at the party were: Bola Makinde, a close younger friend of Queen Ayo Balogun. She wore the aso ebi as well. At the party was Iya Arin popularly called Donapew and Roseline Ajagun popularly called Rosy Baby. Lagos celebrity designer, Cynthia Adeyemi, also stepped out after been off social circuit for a long while. What about beautiful Jumoke Oyeneyin? 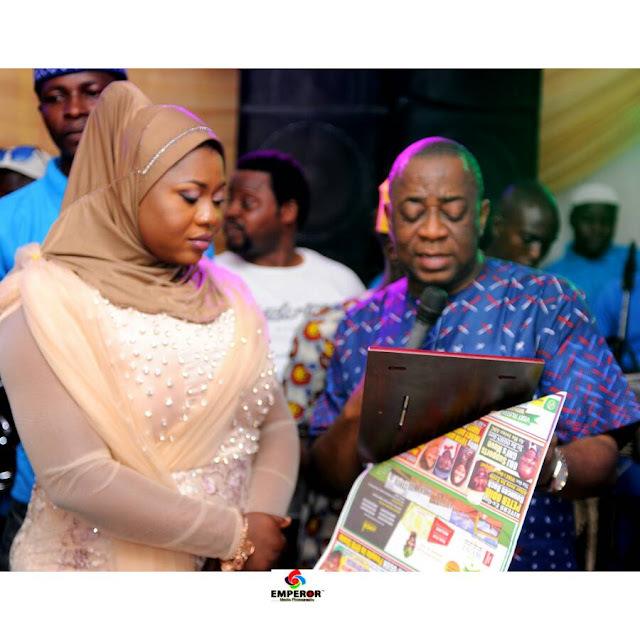 she opted for a white lace instead of the aso ebi and the shine still did not wear off from her, other society women spotted were: Yeye Yemi Akinola, Iyabode Ajayi, Omotoke Ajayi, Ibirin Ayinuola, Toyin Caxton Martins, Temmy T, Taiwo Idemudea, Stella Ogunleye, Shola Morayo Paul, Sheila Ajede, Akomolafe Dorcas, Yeyeoge FAO, Alhaja Kudirat Onigold, Toro Aiyenoro, Oloori Yeye Ajiroba, Bola Ola nee Omole, Olayinka Junaid, Olawunmi Lawal, Mrs Balogun, Bola Odulana, Noni Maha, Princee Wunmi Aladekere,Toyin Arimoran, Adebimpe Amodu, Ayo Orogun, Bolaji Akinbile BJ, Bimbo Koleosho, Funke Smith, Oyinkan Ogunyinka, Faith Onyebuenyi, Abimbola Tayo Amaka, Mrs Adetoba, Fati Ahmed, Funke Adedun,Dolapo Badmus, Bola George Dupe, P,Maclean, Bukola Adebayo, Joko Adewusi, Bimbo Lawal, Folashade Tinubu Ojo, Betty Elegba,Kate, Anne George, Adeola Ogunlade Osunde, Temitope Dada, Jennifer Balogun, Abimbola Obasa, Tolutayo Olabode, Olubanke Edegbai, Seunfunmi Aworh and numerous others.